What is Going on in the Gym? So what in the world is going on in the gym? Well, it is good news! We are getting a maple floor installed. When we completed Nativity Anew II, we replaced the floor tile with a new flooring material. However, soon after the flooring was installed, it began to bubble. The flooring company honored the warranty and re-glued the floor for us free of charge. Within a year, the same problem occurred. The flooring company did some testing and some research and decided to use a stronger adhesive glue to secure the floor. While it took longer, the floor once again started to bubble. As before, the flooring company was willing to honor the warranty and re-glue the floor using an even stronger adhesive. However, unknown to us, the flooring company was uncomfortable with trying the stronger glue; they did not want the flooring to fail again. What they decided was the best option, was to install a wood floor instead of risking another failure of the floor adhesive. The existing floor would serve as a moisture barrier, with two layers of plywood and the maple floor placed on top it. 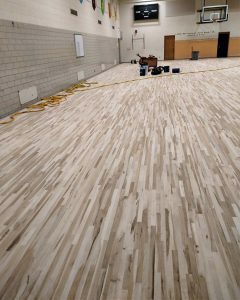 On the advice of the Diocese of Fargo, the original general contractor for the project, and the original architectural firm for the project, we elected to go with the new flooring. Besides, the price was very reasonable…at no cost to the parish. As you can see from the picture above, the flooring material is in place. 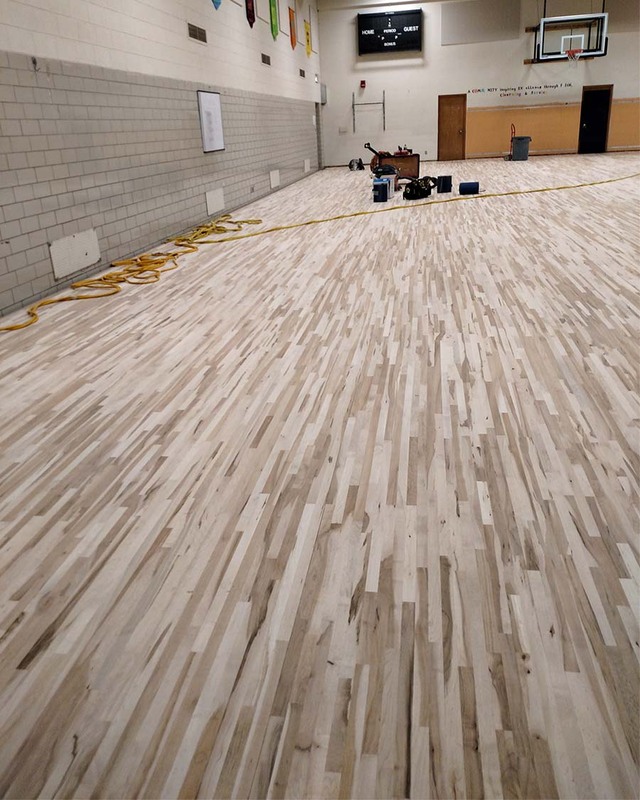 The workers are now sanding the floor and will be sealing the floor over the next week. It is our hope that the new floor will be ready by the second week in September.